Slapstick superstar Johnny Knoxville was relaxing in his hotel after his latest on-set mishap when some dried blood in his nostril caused him to blow hard. 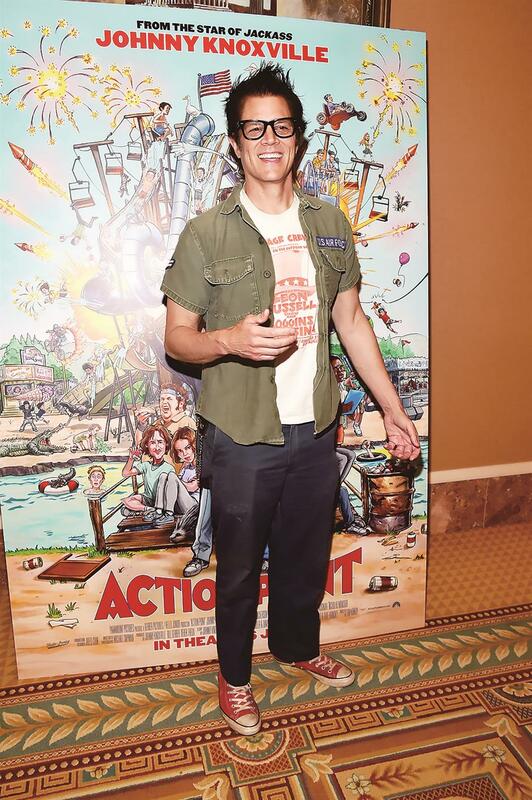 Jackass star Johnny Knoxville at Caesars Palace during a CinemaCon convention in Las Vegas. Slapstick superstar Johnny Knoxville was relaxing in his hotel after his latest on-set mishap when some dried blood in his nostril caused him to blow hard and his eyeball popped out. Luckily, he hadn’t been eating hot and sour soup or taking a bubble bath, and he was able to reach under, scoop it up and push it back into its socket. It was the latest in a litany of injuries that would make the blood drain from the toughest stunt professional’s face — but it was far from the most stomach-churning. “I have, like, 15 doctors for different parts of my body and they all have a special talk with me. I don’t know what to tell ‘em,” Knoxville said. He recalls a day’s shooting for the movie when he landed flat on his face after flying 6 meters through the air off a slide. Knoxville was rushed to the emergency room with a bad case of concussion and a fractured eye socket. In “Action Point,” due out on June 1 in the US, Knoxville, born Philip John Clapp Jr, plays a daredevil who designs and operates his own theme park with his friends. The comedy is inspired by Action Park, which opened in 1978 in Vernon, New Jersey, and built up a reputation for poorly designed, unsafe rides and intoxicated and underage staff.